One week to go and we wil receive the first copies of new Autumn catalogue…I’m super excited! It has been a mammoth job for our team between the new site, the new collection and the Christmas catalogue which is bigger than our Summer one but everything looks amazing! 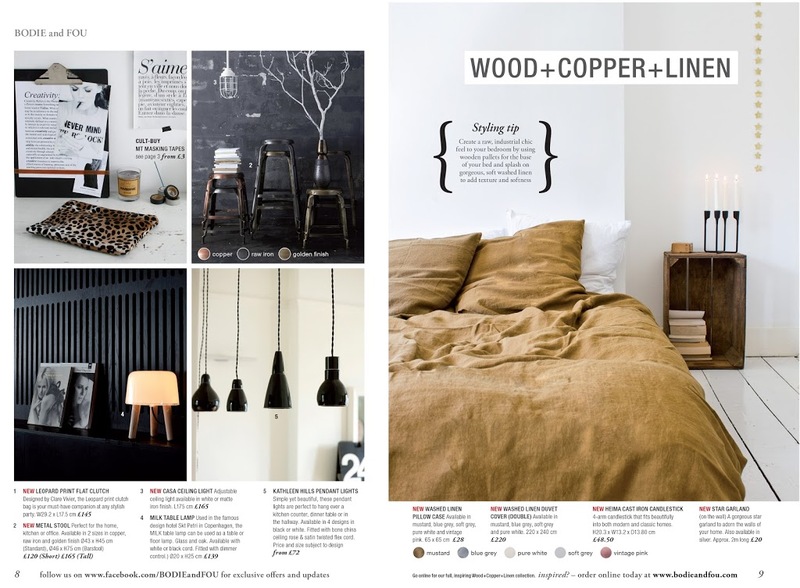 One of my favourite spread is the WOOD+COPPER+LINEN shot by Francois which I styled. OK I admit I’m totally biased given that everything we put in our collection are things we love but this beautiful washed linen collection just makes my heart beat a bit faster. When we shot the cover of our Summer catalogue, I couldn’t resist and treated myself with the blue grey duvet cover and since then added the pure white duvet cover. Elodie bought the soft grey duvet cover which she mixed with white pillow cases – Gorgeous! I read about your blog on the Telegraph’s list of 20 best interior blogs. Love your effortlessly elegant style.